This guide will help you get started on your research into foreign and international law. The resources linked here will include free online sources, subscription databases provided to the law school students and faculty, and print items found in the law library. Please stop by and talk to any of our librarians or reference assistants if you have any questions. 1. Identify and understand your country's legal system. 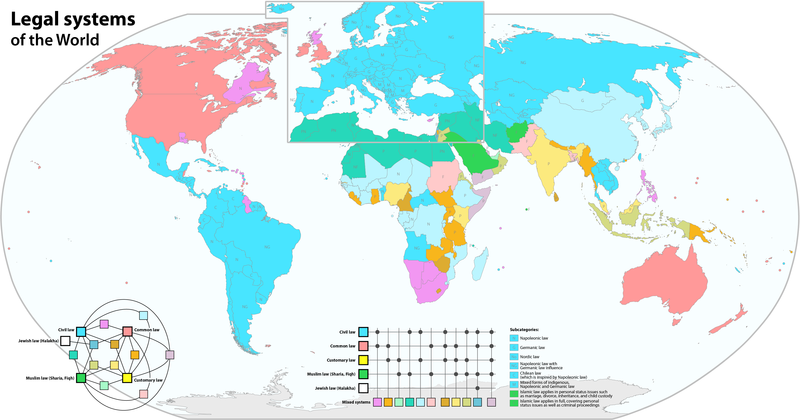 There are generally five different legal systems (listed and identified on the map below) around the world. Making sure you understand how the legal system works before you begin your research can help simplify the process. 2. Identify your country's sources of law. How is the law published? Where is it published? Understand what types of documents you will need for your research. 3. Starting with secondary sources can help you place your research topic into context and give you the necessary background on your country's legal system to begin your research. Black's Law Dictionary (10th Ed.) defines Foreign Law as "generally, the law of another country." For the purposes of this research guide, foreign law is the domestic or national law of a country outside of the United States. Black's Law Dictionary (10th Ed.) defines International Law as a "legal system governing the relationship between countries." This can also include relationships between international organizations or individuals.